This deck is really interesting because it interacts along so many axes. This deck eschews a lot of the traditional midrange cards like Inquisition of Kozilek and Thoughtseize. 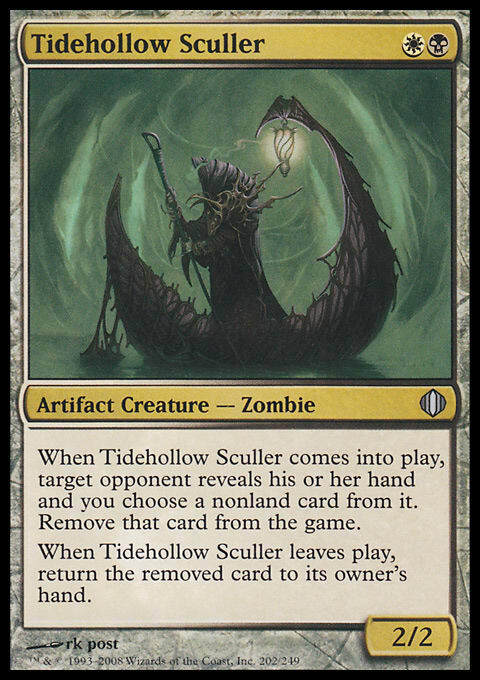 Instead, you’re leaning on the curve of Tidehollow Sculler into Wasteland Strangler to control the board against humans and free up your Tidehollow Sculler or Spell Queller to get blinked by Restoration Angel later on. These four cards are the core of your disruption against combo, control, and beatdown alike. Because of your processing engine, Path to Exile gets the nod over Fatal Push. Settle the Wreckage is a great way to punish all of the all-in aggro decks in this format. These pieces of interaction backup your Wasteland Stranglers and help keep creatures under control. Most of your creatures are pretty beefy for their costs, so you really only need to leverage spot removal on creatures that are part of some kind of combo, that are going far too wide, or that are just a little too big for your Angels to tussle with. Relic of Progenitus is one of the driving reasons to play this deck. So many decks right now care quite a bit about their graveyard. From Hollow One to Jeskai Control to Krark-Clan Ironworks, graveyards are a big deal, and the ability to disrupt them Game 1 and have it be part of your proactive gameplan is a big deal. The last piece of the puzzle is Teferi, Hero of Dominaria. This card lets you turn the corner in grindy matchups, since it can come down and let you leave up mana for cards like Countersquall and Path to Exile. Once you untap with it, it makes it even easier to leave up Restoration Angel and Spell Queller while still advancing your board. This is an exciting take on midrange that combines multiple axes of disruption with the ability to leave up lots of ambiguous disruption. If your opponents haven’t played against this exact list before, they’re going to play into all manner of tricks and get absolutely blown out by interactions they haven’t seen before. If you’re looking for a new way to play fair Magic that can interact in more ways than traditional decks, this seems like a great choice.